I must study politics and war that my sons may have liberty to study mathematics and philosophy, geography, natural history, naval architecture, navigation, commerce, and agriculture, in order to give their children a right to study painting, poetry, music, architecture, statuary, tapestry, and porcelain. Does this capture the Canadian experience? Time for another hack, available on GitHub. # spreadsheet: volume numbers are columns, category ids are rows. # have already been scraped. # This will be a hash of arrays. # Give the user some feedback about progress. # Sometimes there are no matching biographies. # Remove commas from numbers in the thousands. To save time, we scrape the search page and extract the codes for the different volumes and categories. Biographies in four of the twelve volumes haven’t been categorized, so there will be some gaps in our data, but we should have enough to see trends. We build a table of data to analyze in a spreadsheet. 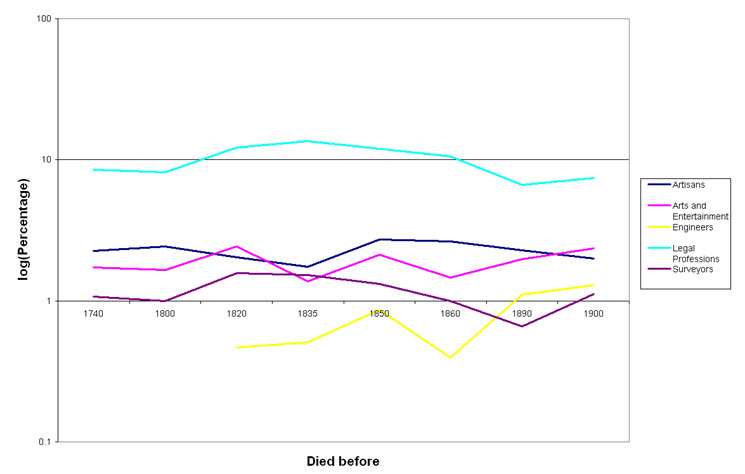 We can then plot the relative proportion of each occupation over time. (Relative because there are more biographies overall in some volumes.) Also, since some occupations are very common (e.g., member of armed forces) and others are not (e.g., architect) we will want to plot the numbers on a log scale. 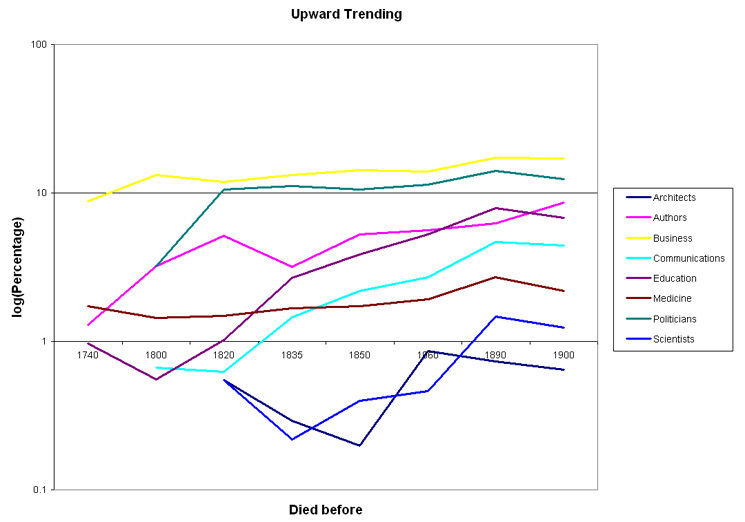 The following three graphs show which occupations lose, maintain or gain ground over time. How about the next generation? 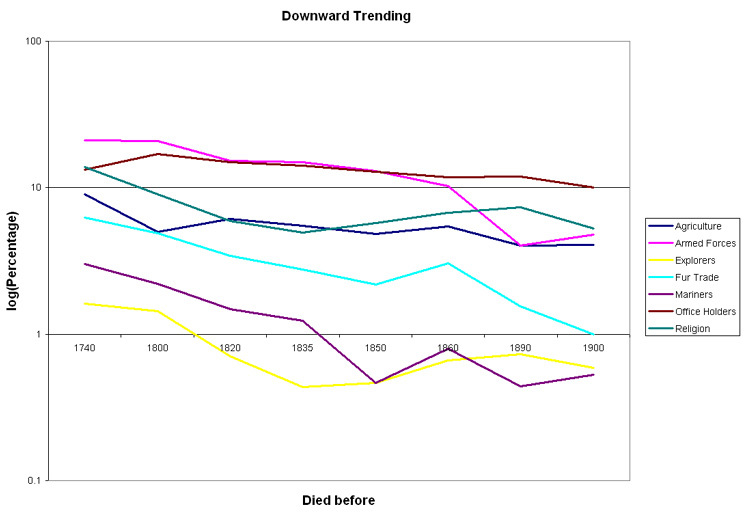 We see a decline in explorers and mariners, in the fur trade and agriculture. Surveying and engineering hold relatively steady. In the final generation we do see an increase in architects, authors and educators. Some predictions (like “statuary,” “tapestry” and “porcelain”) are harder to check. Overall, not too bad for a statement which was never intended as a prediction. 2012-04-17. Revised edition published on http://williamjturkel.net. Internal links changed to point to this site. Graph images uploaded to this site and links changed. Code and CSV links changed to point to GitHub repository. Code and CSV file also displayed inline.